The use of veterinary drugs has escalated over the years, with a wide range of applications, such as metaphylaxis, therapy, prophylaxis, and growth promotion. Public health concerns have been raised regarding residual veterinary drugs in food products and government agencies have established strict guidelines to assure the safety of consumers. Maximum Residue Limits (MRL) have been determined for different food products and some are also completely prohibited due to their hazardous effects. Current techniques used to detect and quantify residual veterinary drugs in food products often involve the use of LC-MS/MS. 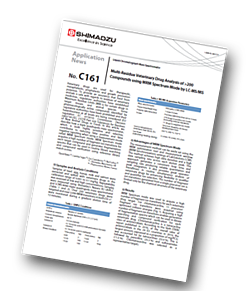 In this application note the use of an LCMS-8060 Triple Quadrupole Mass Spectrometer for the analysis of 212 veterinary drug residues is described. The LC-MS/MS system, equipped with the MRM spectrum mode, utilized the optimal collision energy for each fragment ion and achieved high data densities and sampling rate across each elution peak. 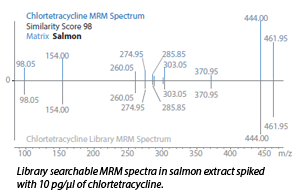 The described method consists of at least a total of 2000 MRM transitions and each product ion spectrum obtained can be compared and verified with a reference library spectrum. These techniques/comparisons greatly increases the reliability of compound identification and reduces false positive and false negative reporting. The method was also conducted in various matrices and it showed consistent results with library match scores above 98.